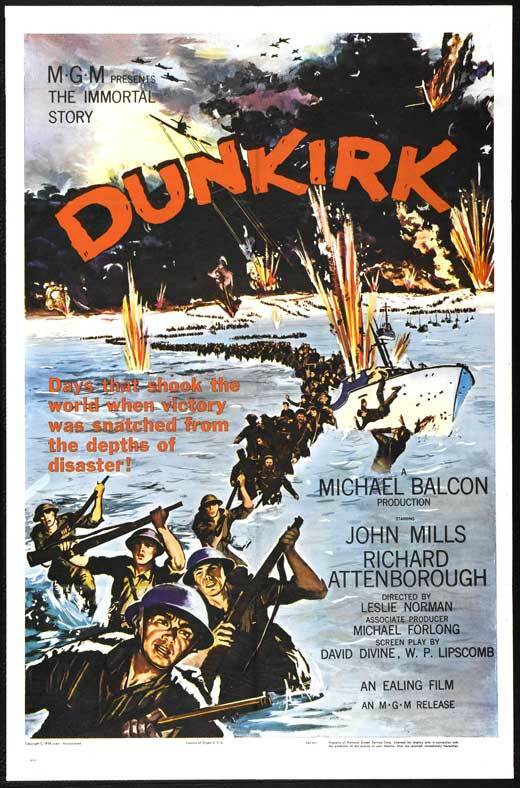 The British movie Dunkirk, starring John Mills, was one of those movies I was really looking forward to. I’m not sure what I expected but certainly nothing as boring as this. Those 135 minutes felt like a mini series. That’s too bad as the story of Dunkirk has a lot of potential or someone like Hugh Sebag-Montefiore wouldn’t have been able to dedicate a 700 pages tome to this story only. As boring as it was at times, it’s not a bad movie but it has the wrong title. It isn’t really about Dunkirk. Dunkirk tells two parallel story lines and that’s where it fails. One part of the story follows the men around Corporal Tubby Bins (John Mills) who is involuntarily in charge of a group of men cut off from the rest of the army, somewhere behind enemy lines. The other story line focusses on the British civilians who slowly begin to understand that they may no longer be able to stay out of the war and that each and every little contribution is valuable. The stories converge on the beaches of Dunkirk where hundred thousands of British and French soldiers are trapped and waiting to be rescued. This was one of the biggest rescue missions of any war ever. And many of those who courageously helped save others lost their lives. By dividing the story in two and showing the tragedy of the trapped soldiers only in the last 15 minutes, the movie failed to give an accurate picture. Although Atonement is certainly not a war movie, I thought it captured Dunkirk far better (I attached the scene under the Dunkirk trailer for those who are interested). It’s more sentimental but for my taste Dunkirk was too sober. Something I liked in the movie Dunkirk was the way they showed how the civilians got dragged into the war. All the scenes on the British home front are far more convincing. I think, if they had called it “Operation Dynamo“, as the rescue mission was called, and if they had considerably cut the John Mills’s scenes, it would have worked better. It seems that there is a very good TV mini series called Dunkirk as well. I’m going to watch it soon and will let you know if it is any better. Starting just before the Battle of Britain The Way to the Stars tells the story of two friends and the people that surround them on a British airbase. Flight Lt. David Archdale (Michael Redgrave) and Pilot Officer Peter Penrose become friends when Penrose (John Mills) arrives at the base where Archdale is squadron leader in 1940. The years go by. Penrose who was a total rookie at the beginning of the movie becomes a good pilot. Archdale gets married to the hotel manageress Toddy and they have a baby. Penrose falls in love with Iris who lives at the hotel with her very stern aunt. In 1942, just before the Americans join the base, Archdale doesn’t return from a mission. Shortly before this he withdrew Penrose from flying duty as he had done far too many missions. He was now a controller which he hated. When his friend dies he becomes very bitter and breaks up with Iris. The arrival of the Americans in 1942 changes the tone of the movie. We could say that we become witnesses of a real culture clash. I think this is very well done and the movie manages to do both countries great justice. I enjoyed this a lot as it is so insightful and does poke fun at both. One of the American pilots, the eponymous Johnny (Douglass Montgomery), plays an important role in the second half of the movie. He is married but he likes Toddy a great deal, probably falls in love with her. This is not a clichéd story of an adultery but a nuanced tale of two people who meet each other, feel very close and realize that under other circumstances they would have become lovers. For the aviation buffs out there I have to say that we see no combat scenes but we benefit greatly from the time during which this movie was shot as you will hardly see so many original planes and different types of planes in any other movie (certainly not in anything modern). We get a particularly good feel for the American Flying Fortress. An important part of the movie takes place in Toddy’s hotel which allows for some great character portraits. It is quite a motley crew that one would have encountered in a hotel during the war. Another interesting aspect. 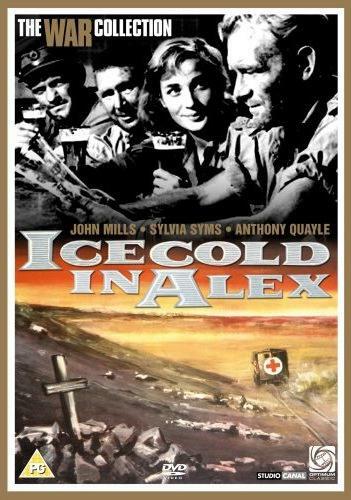 Ice Cold in Alex (1958) or When did Beer ever Taste this Good? Picture this: It is a hot summer day. 45°/113° in the shade. The sun is blaring. Water is scarce. You are more than just thirsty. You have to overcome a lot of obstacles to get out of the sweltering heat. But at the end of the day the coldest lager in the Middle East is waiting for you. What are you going to say: “Worth waiting for”. Now this is exactly what John Mills´ character Captain Anson says after they finally arrive at Alex. Ice Cold in Alex tells how they get there. In 1942 a little group of people, two nurses, two British officers and a suspicious South African officer attempt to cross the desert from Tobruk to Alexandria, crossing minefields and enemy territory. They have to fight more than the heat, flat tires and German attacks. Captain Mills must try and come to terms with his alcohol problem. After his drinking leads to a disaster he swears he will not drink anymore until they are in Alex. Ice Cold in Alex is a real classic. The black and white makes the actors look twice as expressive as they would have been anyway. It is an adventure story in front of a WWII background. It is not your ordinary action-driven, combat-flick but a fine piece of British cinema. And the end-scene, when they finally make it to the bar and get their lager is memorable. Apparently they had to shoot the scene so often that John Mills was really drunk at the end of it. Another interesting observation: this is probably one of the earliest examples of product placement in a movie.